This post is part of the 2016 Baseball Continuum Blogathon For Charity, benefiting the Roswell Park Alliance Foundation. The Roswell Park Alliance Foundation is the charitable arm of Roswell Park Cancer Institute and funds raised will be “put to immediate use to increase the pace from research trials into improved clinical care, to ensure state-of-the-art facilities, and to help improve the quality of life for patients and their families.” Please donate through the Blogathon’s GoFundMe page. I received it from a relative who found it at a Goodwill store or something like that, but where did it come from? How did it come to be? However, there were, according to Retrosheet, only 16,248 people in attendance that day. Were there 10,000 or so kids and only 6,000 or so adults? Did they just give them out to everybody? We may never know. 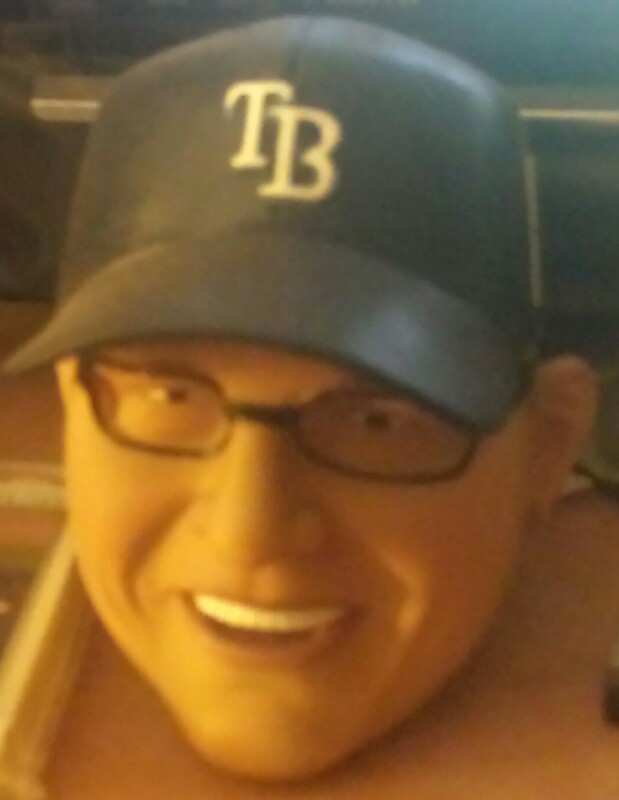 We also may never know how this, a bank in the shape of Joe Maddon’s head, got to upstate New York. I’d like to imagine it had crazy adventures, traveling the country with it’s fellow TV-situated souvenirs, a Buck O’Neil bobblehead and an even-more-inexplicable San Diego Padres-era Adrian Gonzalez statue. Or maybe somebody just went on a vacation to Tampa, brought it back up, and didn’t want it anymore. I prefer the first possibility. This post has been part of the 2016 Baseball Continuum Blogathon For Charity, benefiting the Roswell Park Alliance Foundation. The Roswell Park Alliance Foundation is the charitable arm of Roswell Park Cancer Institute and funds raised will be “put to immediate use to increase the pace from research trials into improved clinical care, to ensure state-of-the-art facilities, and to help improve the quality of life for patients and their families.” Please donate through the Blogathon’s GoFundMe page. This entry was posted in Baseball, Blogathon, MLB and tagged Blogathon, Joe Maddon, Piggy Bank, Rays, Tampa, Tampa Bay, Tampa Bay Rays by danglickman. Bookmark the permalink.